October is Breast Cancer Awareness month. 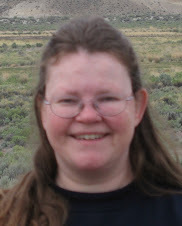 I am an ovarian cancer survivor. 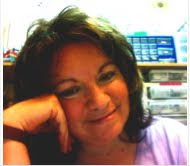 During my chemotherapy sessions I met another cancer patient names Pat. 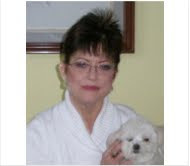 She and I would become friends and allies in our battles with cancer. 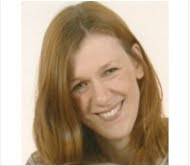 She had a calm grace about her and always had a smile. I would like to dedicate this card to Pat, whose strength amazed me, whose family drew strength from love and whose friendship I shall treasure always. 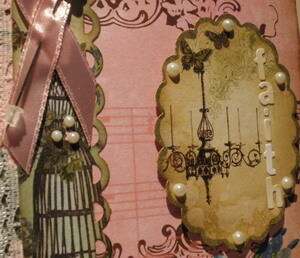 Using the Score-Pal, score one line at 2 1/8” from each side of the bling cardstock. The score lines will be 5 1/2” long and will go vertically from top to bottom of the card. The card will open from the center. Using your craft mat and ink blending tool, blend Aged Mahogany ink on the edges of the two Webster front panels. Ink the Music stamp with Black Soot ink. Take a paper towel and swipe gently in places to remove some or all the ink. This will add to the vintage look of this card. Mount the panels onto your card base. Using the Vintage Label Punch from McGill punch once with blue paper and once with brown/goldish paper. 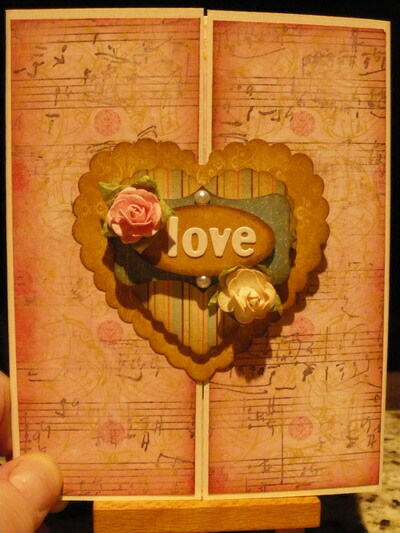 Use the blue larger and the brown smaller oval labels for this card. Using a craft mat and blending tool, blend Brushed Corduroy around the edges of all four punched pieces. First, protect your card by covering the right part of the card with scrap paper. 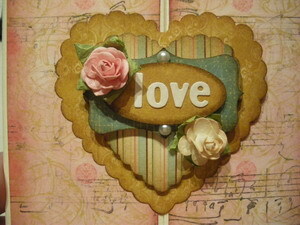 Using a glue stick, put glue on the left half of the large punched brown heart. Glue the left side of the heart to the card. 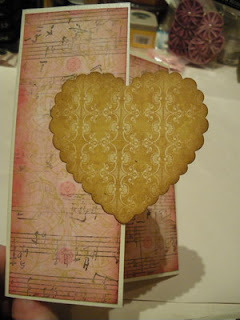 Put glue on the back of the blue heart (same sized one), and glue the entire heart to the back of the one that you just glued to the card. 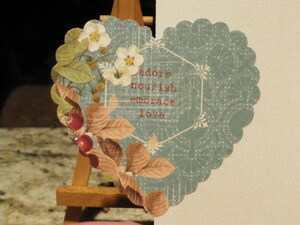 This will cover up the back side of the first heart and also be a pretty accent on the inside of your card. Attach the smaller heart to the center of the first heart. Attach the brown oval to the blue label. 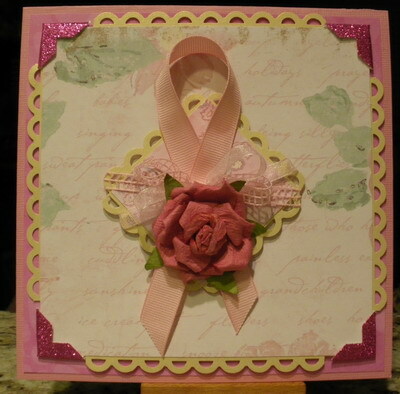 Glue a pink rose upper left and a white rose lower right on the medallion. Add two pearls to the medallion. This is an easy card with an elegant look. It is different because of the center opening. Hope you try this out! See you next time! Cut Flamingo cardstock to the size of 5 1/2"X8 1/2", score it and fold in half. Cut Chicky Check pattern paper to the size of 4"X5 1/4" and adhere to card. Cut Flamingo cardstock to the size 2 1/4"X4". Cut Tiny Bubbles pattern to the of 2 1/8"X3 7/8". Adhere pattern paper to cardstock, tie with polka dot ribbon, and adhere to card. Stamp Erte in Coat & Scarf image and Fashion in Rouge ink onto Vanilla cardstock, trim, and sponge edges with Rouge ink. 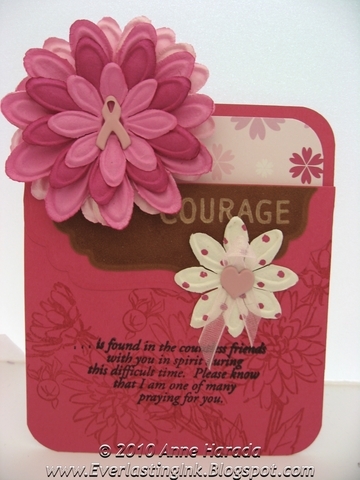 Layer onto Flamingo cardstock and adhere image and quote to card. Embellish with three pink pearls. October is Breast Cancer Awareness Month. I would like to dedicate this card to all whose lives have been touched by this disease and whose families help support them during this difficult time. (Webster’s Pages Petite Papers Pad was a great way for me to sample many of the lines. 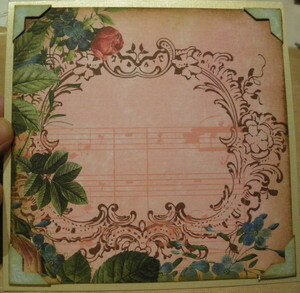 The papers are very vintage and have a wonderful feel. Fold your gold cardstock in half to form your base card. It will open from the bottom. (I keep saying it but I LOVE this punch! I can have any paper photo corner I want and I never run out!). Using your craft mat and ink blending tool, edge the photo corners and 5 1/4" x 5 1/4" paper with brushed corduroy distress ink. Attach your photo corners to your paper and glue to your card base. Take your strip of paper (blue also) and punch the apron lace border design from Fiskars in it on the right side. Edge this in ink with your blending tool also. I used double stick tape to add my lace to the back of this strip. I left about ¼” of lace showing on the LEFT side. I glued the finished strip to the card after I had trimmed it to 5 1/4”. 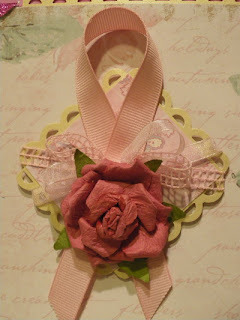 Take your pink ribbon and make the cancer ribbon design. Add a glue dot to hold it together. 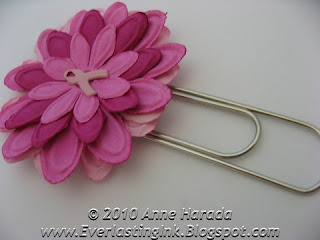 Use one of the trinket pins and attach to the ribbon only. Attach the ribbon to the card at the top of the blue strip with mounting tape. Punch a 3” scallop oval out of another selection of paper. I used a beige color. Using a krylon gold pen, edge the oval all around. Using your blending tool, add brushed corduroy ink to the oval also. Spray some water in your hands and toss the droplets onto the card. Add the word “faith” in lower case letters (micro mono basic grey). 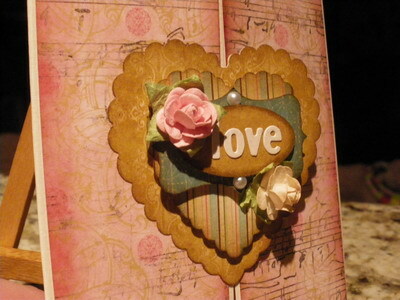 Add mounting tape to the back of the oval and attach to the right of the card. Add pearls on the oval and also on the waist of the dress form in the strip. Add one pearl in the center of the trinket pin flower. Thank you for stopping by today. See you again soon! Cut Daiquiri Glitter pattern paper to the size of 4"X5 1/4". 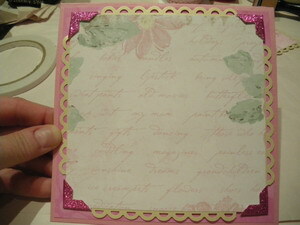 Cut 1 1/2" from top of Daiquiri Glitter paper and flip over to use reverse side. 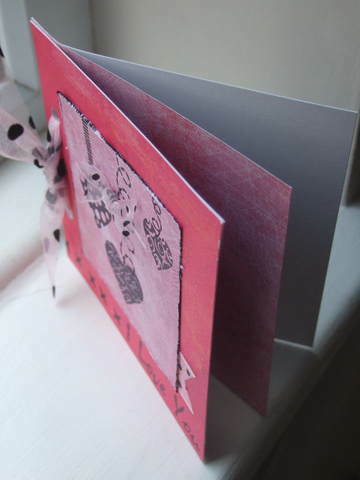 Adhere paper to card and embellish card with ribbon where the two different sides of the paper meet. Stamp Smoking Lady image and Oooh La La in Rouge ink onto Vanilla cardstock, trim, and sponge edges with Rouge ink. Layer onto Flamingo and Anchorage cardstock and adhere image and quote to card. Embellish with pink stripe flowers and brown pearl brad. Choose a medium and a large sprite. Roll each pedal of each of the two sprites around a narrow cylinder (I used a small crochet hook), curling the pedals under the flower. Use the brad to put the two sprites together to form the flower. 6 3/4" x 4 3/4" 5" x 2 1/2" 7" x 2 3/4" 3 1/2 x2 7/8" 5" x 1/8"
Stamp "You're simply the Best!" centered on the white card-stock panel. Sponge the edges of the white card-stock with the artprint brown ink to tone down the whiteness. Stamp several of the large flowers randomly off the edges of the Thankful paper. Emboss the textile texture onto the 5" x 2 1/2" piece of pink card-stock by placing it into the embossing folder and running through the Cuttlebug machine according to manufacturer's directions. Punch 3 ribbons out of the scrap of pink cardstock using the support ribbon punch. 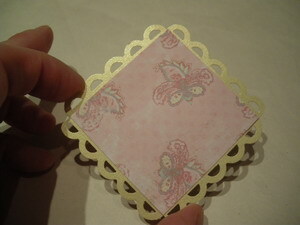 Fold the largest pink panel in half to form a 5"x7" card. Layer the 6 3/4" x 4 3/4" piece of brown paper onto the card front. Affix the 5" x 2 1/2" across the bottom portion of the card, about 3/4" from the bottom edge. Add the 5" x 2" embossed pink panel on top of the brown panel. Add the very narrow brown strip to the pink panel about a quarter of an inch from the bottom of the pink panel. Affix the 7" x 2 3/4" brown panel to the card, about 1/2" from the fold. Affix the stamped Thankful panel to the top brown panel. 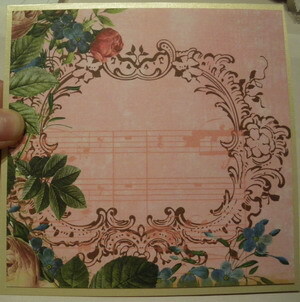 Add the 3 1/2 x2 7/8" brown panel to the top area of the card, about 1/2" from top and right edges. Add the white panel to the right side of the brown panel. Attach the three punched ribbons to the left side of the brown panel. Use a glue dot to attach the flower. The structure of this card came about by accident, when I messed up the white background that I had mounted the pink onto. I decided to cut down the card and was left with a square wondering what to do with it. On a 3 inch square of pale pink paper stamp 3 of the stitched borders from the top and stamp the hearts so that they appear to be hanging. Distress edge of paper with scissor blade and then run edges along black ink pad. Tie a knot in a piece of ribbon and glue to middle heart string. Using some waste ribbon, attach between the light pink layer and a 4.5 inch square dark pink layer. 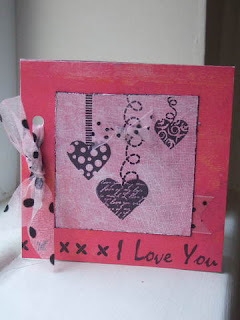 Stamp cross stitch border and I love you on dark pink card. 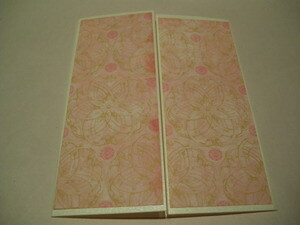 Cut another piece of white card and a piece of pale pink paper the same size as the card front. Crease these ¾ inch from edge and glue to the front. Punch two holes and tie with wide spotty ribbon. Fold your Bazzill petunia in half to form your base card. The card will open from the bottom. Take your piece called Playground Flowers and attach to front of card. Set aside. Punch 2 11” border strips with the Fiskars punch. 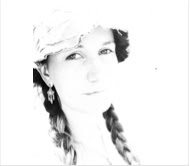 – This picture shows a sample of what the border will look like. You will want to punch 11” borders with a 1/4” base. 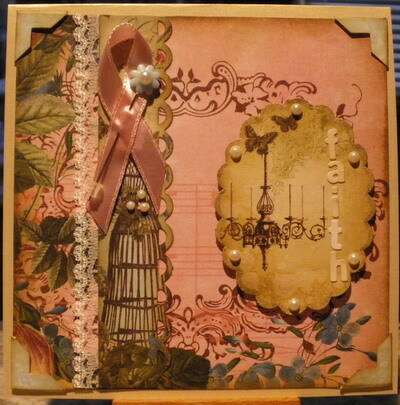 Take your large Melissa Frances paper and attach the punched borders, one side at a time. Punch four photo corners fro the hot pink glitter cardstock. Attach the photo corners to the Melissa Frances paper. Attach this completed piece to your card. Punch out 11” strip of gold cardstock with the Fiskars punch. Add double stick tape to the back side of the 2x2 Overwhelmed piece. Complete one side at a time only. Lay the punched strip down on your work surface, right side facing up. Take your 2x2 piece, right side facing up, and lay one edge down on the punched strip. The double stick tape will attach the strip to the back of your square. Cut the strip so that there is no overhang. 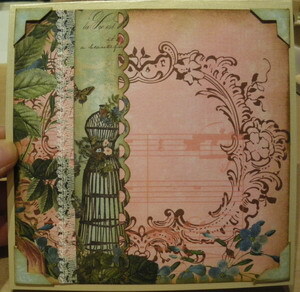 Continue, one side at a time, until all four sides have the punched border. 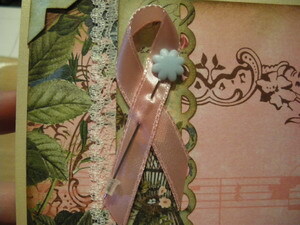 Take your 1/2” grosgrain pink ribbon and make your breast cancer ribbon design. Put a glue dot between the intersecting ribbon tails and glue one over the other. Remember that your square will be turned on its points like a diamond when its attached to your card. Take a second glue dot and glue the ribbon to the square. The ribbon should touch the top and bottom points more or less. 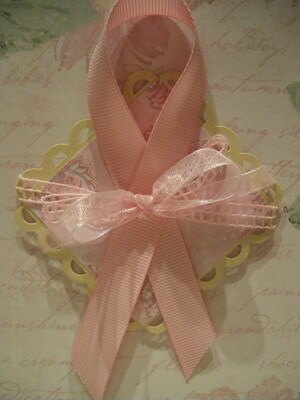 Take both 1/4” ribbons and make a bow. 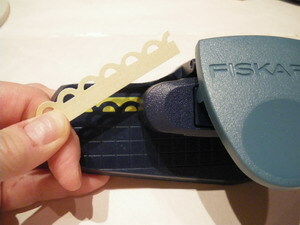 Attach the bow to the center of the larger ribbon with a glue dot. Add mounting tape to the back side of the square. Take the tails of the smaller ribbons and wrap them around the back. Attach to the back by adhering them to the mounting tape. Attach your centerpiece to your card. Add a pink rose with glue dots to your center piece under the ribbon bows. This card is fairly easy to make and can be made with any pink papers you have. 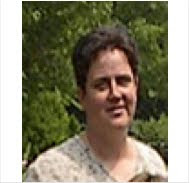 I hope that you will make this card and send it to someone special. Fold an 11” x 4” piece of white cardstock in half to create a 4” x 5-1/2” card base. 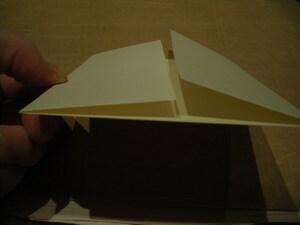 While folded, round the corners of the card. Using the Nestibilities Label 4 dies, cut out a suede and Taffy label. Layer together then cut in half. You will only use one of the halves of this piece for this project. Fold the Taffy card base in half. Score one of the long ends of the Taffy base card stock at about 1” and fold inward. 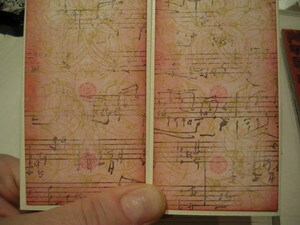 With the card folded, round the corners. 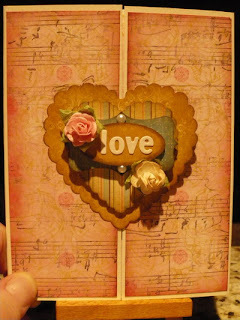 Open the card base again and then adhere a 5-1/4” x 3-3/4” rectangle of the Hearts and Flowers DP to line the inside of the card base. 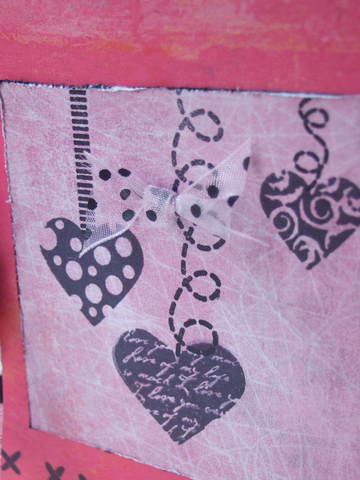 Add strong adhesive to the sides of the card base next to the lining. Fold in half to seal the sides and create the pocket. Stamp monochromatic flower images on the front of the card base using Crimson ink. Align the cut side of the suede label half (Step #2) with the folded edge of the card base (this is the front of your pocket card). Adhere it to your Taffy base. Stamp the word “Courage” with white pigment ink onto suede piece. Add sentiment using computer or stamp as shown in sample. 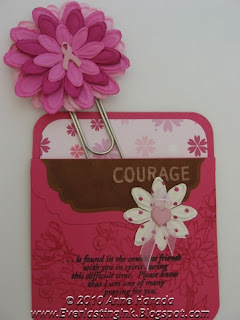 Cut scrap pieces of ribbon and add glue to ends. Position under the sentiment layer. 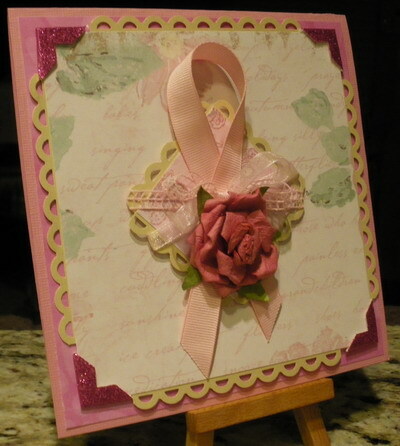 Embellish the card with Prima flowers, Breast Cancer Awareness brads and pink ribbon. Layer 5 pink Prima flowers in graduating sizes. Bind together using Breast Cancer Awareness brad through the center of the flower. 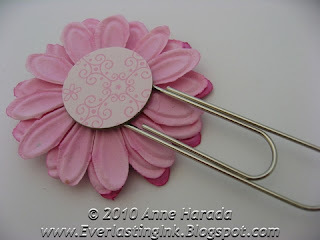 Glue a 1” chipboard circle to the end of a jumbo paper clip using strong tacky glue. 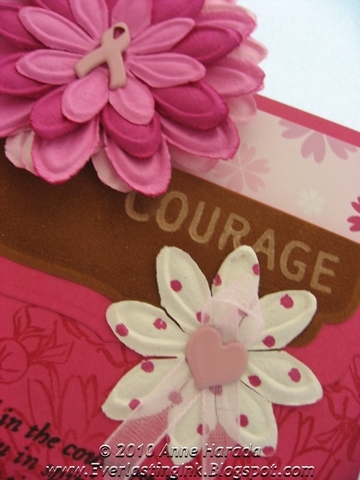 When dry, glue the 5-layer prima flower you created to the front of the jumbo paper clip centering over the chipboard piece. Punch a 1” circle of scrap pink patterned paper. Glue to the circle chipboard back. 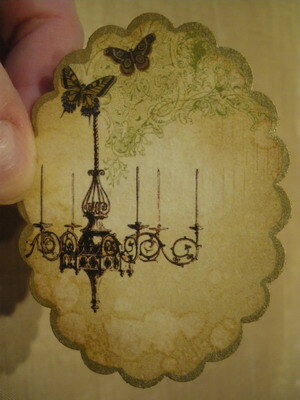 Let flower bookmark dry completely before inserting into pocket card. Cut Blocks & Hearts pattern paper to the size of 4"X5 1/4" and adhere to card. Cut Blossom cardstock to the size 2 1/2"X4". 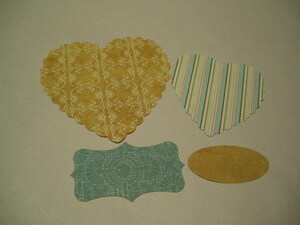 Cut Blocks & Hearts pattern to the of 2 1/8"X3 7/8" and emboss with Textile Texture embossing plate using the Cuttlebug. 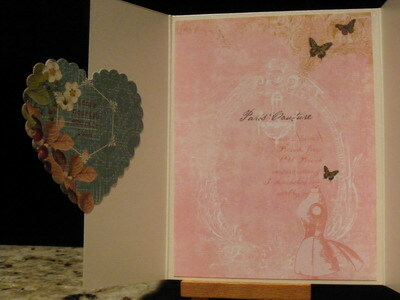 Adhere embossed piece to Blossom cardstock. 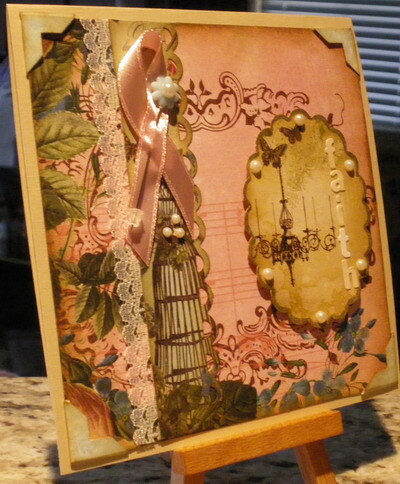 Embellish with double loop pink ribbon and adhere to card. 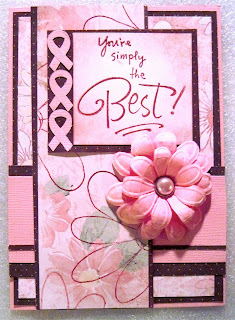 Stamp floral image and quote in Rouge ink onto Vanilla cardstock, trim, and sponge edges with Rouge ink. 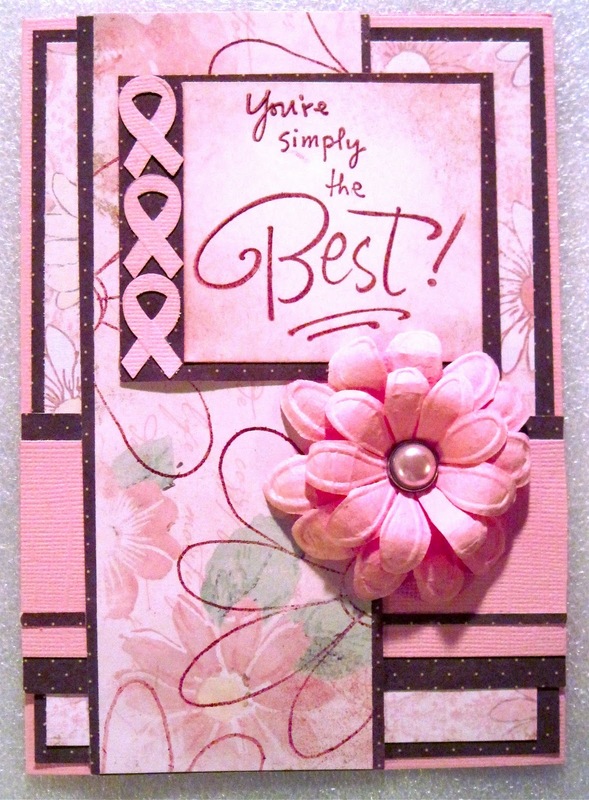 Layer onto Blossom and Flamingo cardstock and adhere image and quote to card. Punch "The Cure" out of Flamingo cardstock and adhere to quote. Embellish with pink flowers and pearl. Cut the background paper for the album's size. Adhere the picture in the center. 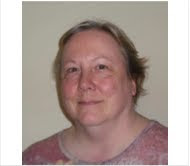 And cut another one, to focus on a person, and add it in the corner. Use a bowl to draw circles around the picture and on the sides. Add circles with acrylic paint.